You can use a flat square stitch to create drapey bead woven fabric. With square stitch, the beads are aligned in a true grid formation, with straight horizontal rows and vertical columns. You perform square stitch by working back and forth, switching direction with each row. Alternatively, you can use a beading loom to stitch square stitch patterns, and vice-versa. Square stitch is most convenient for smaller stitched items where setting up a loom and weaving in thread ends would be less practical. Begin by gathering your beadweaving supplies and preparing your needle and thread. When you're ready to start stitching, pick up all of the beads for the first (bottom) horizontal row of beadwork and gently slide them down to your stop bead or bead stopper. In the diagrams, the blue beads represent this first row. Hold the beads between the finger and thumb of your non-dominant hand to keep them in place. Then pick up the first bead for the second row (yellow in the diagrams; Step 1 above). 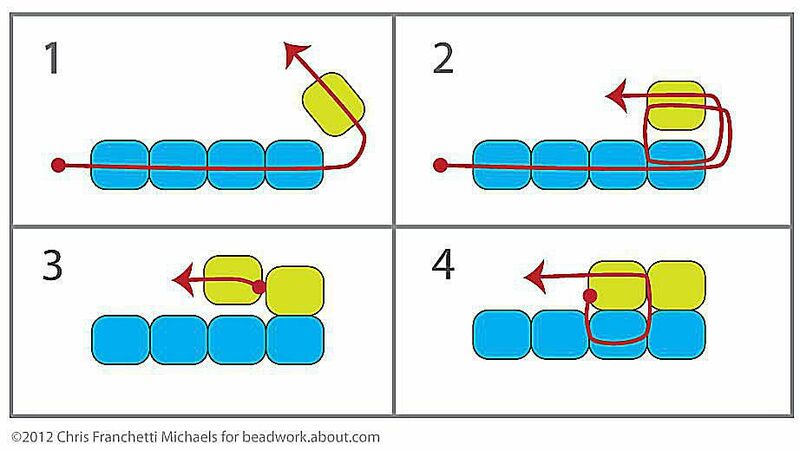 If you are left-handed, you may want to string and hold the first row of beads from right to left, rather than from left to right as shown in the diagrams. Stitch the first bead of the second-row bead in place (step 2 above) by passing through the last bead in the first row, pulling the thread taut, and then passing through the first-second row bead again. Hold the new bead between your finger and thumb and give the thread a couple of tugs to tighten up the tension. For most designs, it's a good idea to do this after every stitch. The second row of flat square stitch can be the most challenging. Take your time, and don't become discouraged. The stitching tends to become easier as your beadwork grows in length. Pick up the next bead for the second row (Step 3 above), and then pass through the bead directly below it, going in the opposite direction. Pass forward through the next bead in the second row again (Step 4 above) and pull your thread taut. Repeat the process of picking up a new bead, reversing direction, passing through the underlying bead, and then passing through the new bead again (Step 5 above), until you complete the second row. Although not shown on the diagrams, many people find it helpful to stitch down the entire first row and then back up the entire second row to align the beads and tighten the stitches. If you feel the beads are not fully aligned or are loose, you may want to try doing this after completing every second row. Pick up the first bead for the third row (orange in the diagrams; step 6 above) and then pass through the last bead in the second row and through the new bead again (step 7 above). Pull the thread taut. Pick up the second bead for the third row, pass through the bead below it in the opposite direction, and then pass through the new bead again (step 8 above). Pull the thread taut. Continue this process to stitch one bead at a time until you reach the end of the third row. Then reverse direction and stitch the first bead for the fourth row the same way you stitched the first bead in the third row. Keep stitching one row at a time, back and forth, until you have your desired length of beadwork or until you complete your pattern. The beaded pendant pictured above was stitched using flat square stitch and Toho Treasures cylinder beads. If you are working from a square stitch or bead loom pattern, you will need to keep track of your place and know what row you are working on. To count your rows in square stitch, count the last bead on the outside edge of each row of beads. Don't try to count your rows in the center of the beadwork because it is very easy to lose your place, particularly if you are working an intricate pattern with several colors. If you are ready to try square stitch, you can use it to make the Moroccan Coral Bracelet.